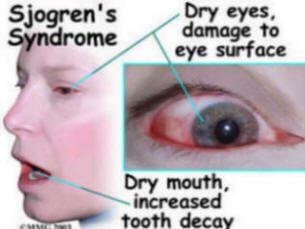 Sjogren's syndrome (SS) is a relatively under diagnosed cause for dry eyes (xerophthalmia) and mouth (xerostomia), and the diagnosis is often delayed for months to years. Like most autoimmune conditions, it tends to affect mainly women, with a female-to-male ratio of 9:1. Although it can affect all age groups, its peak age of onset is in the fourth and fifth decades. The syndrome is a multisystem autoimmune disorder affecting primarily the exocrine glands in the body. The lesion in this disorder starts with lymphocytic infiltration of the salivary glands leading to inflammatory symptoms including swelling and pain. Later, the glandular tissues atrophy and progressively disappears leading to reduced secretions. The disease process is not limited to salivary glands and may affect virtually all organs, including lungs, nervous, system and kidneys. Although there is evidence for genetic (HLA-DR3)2 and environmental (viral infections) associations,3 their exact contribution to the disease process is still unknown. Approximately half of all cases of the syndrome are primary cases while the remainder (secondary SS) are associated with autoimmune conditions, including systemic lupus erythematosus (SLE), rheumatoid arthritis (RA), and thyroiditis. Both primary and secondary SS are similar in symptoms and signs, although primary SS tends to have more prominent sicca symptoms while secondary SS is less associated with anti-Ro and anti-La autoantibodies. As the disease affects exocrine glands primarily, the earliest symptoms are of reduced tear and saliva production. Patients often present complaining of a burning, sandy sensation under the eyelids along with itching and redness, difficulty in swallowing dry foods or speaking continuously, a burning sensation in the mouth or an increase in dental caries. In 60 per cent of primary SS, there may be salivary gland enlargement. This may be unilateral initially but becomes bilateral. In addition, other exocrine glands in the body may also be involved, leading to hoarseness, dry skin and loss of vaginal secretions. SS is a systemic disease and patients with primary SS often report general constitutional symptoms such as fatigue, low-grade fever and myalgias. Half of patients also report arthritis, which may be deforming due to periarticular tissue damage with no signs of erosions on x- rays (Jaccoud's arthropathy) asopposedtothe erosive disease seen in RA. Skin signs include Raynaud's phenomenon and purpura secondary to dermal vasculitis. Primary SS may also present with major organ involvement. Nervous system involvement may manifest as a mononeuritis multiplex as a consequence of small vessel vasculitis. Liver abnormalities including hepatomegaly and elevated alkaline phosphatase may be found in primary SS, often associated with anti- mitochondrial antibodies. Renal involvement is found in 5 per cent of SS, often as glomerulonephritis, and SS may also be associated with a sterile interstitial cystitis, leading to nocturia and pain. SS may affect the entire respiratory airway leading to a dry cough, airway obstruction and rarely interstitial lung disease. The sicca syndrome needs to be confirmed by simple objective clinical tests that assess gland secretion. A Schirmer's tear test can be easily performed in clinic (see box left). Unstimulated whole saliva sialometry, used to assess saliva production (see box right), can also be carried out in a clinical setting. With the results of the two clinical tests, the main investigations to consider include biopsy of a minor salivary gland (usually of the lower lip) and the presence of autoantibodies. Anti-Ro and anti-La antibodies are found in 60 per cent and 40 per cent of primary SS respectively. Rheumatoid factor is also found in 60 per cent of primary SS with no underlying diagnosis of RA. General blood results may include elevated inflammatory markers, leukopaenia and hypergammaglobulinaemia on serum electrophoresis in 80 per cent of cases. The probability of SS is high with a history of sicca syndrome for at least three months confirmed with either Schirmer's test or sialometry along with anti-Ro and/or anti-La positivity. If the suspicion of SS is high despite negative results, a salivary gland biopsy will be required. Other investigations including sialography to assess the salivary gland ductsystem, rose bengal staining of the cornea and scintigraphy for salivary gland function may provide additional information. 1. Bend the Schirmer's test strip at the indentation and place the shorter end under the lower eyelid. 2. Leave test strip for five minutes. 3. Measure how much of the test strip is wet from the indentation. 1. Use a container/beaker used for measuring volume. 2. Over 15 minutes, collect all saliva produced by spitting into the container. Instruct patient not to swallow during this time. Dry eyes should be lubricated regularly with artificial tears. There are various preparations of eye lubricants but the more viscous drops should be used before bedtime as they are longer lasting but can cause blurringofvision. It is important to avoid factors that may exacerbate dry eyes, including windy environments, cigarette smoking and drugs such as anticholinergics. In severe disease, where lubricants are ineffective, surgical treatments including punctual cauterisation or lateral tarsorrhaphy may be used. Sugar-free lemon drops or flavoured lozenges are often used as first-line treatment to stimulate the production of saliva for xerostomia. These stimulants need to be sugar-free, because the risk of dental caries is high inSSandoralhygieneshouldbe emphasised to patients. Some patients may prefer the use of artificial saliva as an alternative, particularly at bedtime. Severe organ involvement including interstitial lung disease, nervous system involvement and vasculitis will require systemic corticosteroids and other immunosuppressive agents, including cyclophosphamide and azathioprine. These agents are usually initiated and monitored by a specialist secondary care unit. The risk of CHB requires regular fetal echocardiograms. Any signs of heart block will require immunosuppressive treatments. Primary SS in most cases has a long benign course. Some large, long-term follow-up studies have found no increased mortality among patients with primary SS compared to the background population. However, there are factors that may increase the morbidity and mortality rate in a subgroup of SS patients (see box below right). These lymphomas tend to be of B-cell origin, which may produce rheumatoid factor. They are usually extranodal and in over half of cases, are found in salivary glands. The physician should always be alert to patients who complain of persistent, painful parotid gland enlargement, which may be bilateral. In this situation, a referral for an urgent biopsy may be required. Other signs associated with lymphoma include splenomegaly and lymphadenopathy. Physicians should also be alert to a history of persistent fever, unexplained weight loss and night sweats. The severity of the malignancy varies widely, but some of the lymphomas may be of low histological grade and may go into remission spontaneously or with immunosuppressive treatments given for systemic SS alone. The clinical picture is much more complicated when SS is associated with connective tissue diseases such as SLE, since these disorders have similar disease features to SS. All cases of suspected SS should be referred to secondary specialist care initially. Primary SS will require investigations for potential systemic or major organ involvement while secondary SS will require management of the associated autoimmune disorder. * Glomerulonephritis. Purpuric rash. Cryoglobulinaemia. Low complement levels. Risk factors for lymphoma: Persistent painful salivary gland enlargement. Splenomegaly and lymphadenopathy. Persistently active SS-anaemia, lymphopaenia, low grade fever.